The context for our project is the Anglian occupation and settlement of the Lothians, and the establishment of their brand of Christianity throughout the region. Anglian expansion into the Lothians began during the reign of Ethelfrith (AD 592-616), who had defeated the Gododdin at Catterick in around AD 600. In around AD 603 he defeated King Aedan of Dalriada at Degsastan, an unidentified battle ground probably in the lower Tweed basin or in Liddesdale. Two key historical events bookmark the Anglo-Saxon period in the Lothians: in AD 638 Edinburgh was besieged by Oswald, king of Northumbria; and in AD 973 Edgar of Wessex ceded Lothian to the Scottish king, Kenneth II. The most important secular site in the Lothians in Anglian times was probably at Dunbar. Excavations at Castle Park, Dunbar, suggest that this was the location of an indigenous British tribal centre, which was later taken over by the Northumbrians. This is supported by historical records, which suggest that the town was a royal stronghold in the 7th century AD. Archaeological evidence for the Northumbrian presence is dominated by the identification of timber halls akin to the feasting halls or mead-halls that feature in the Old English epic poem, Beowulf. One such timber hall was excavated at Doon Hill, and another is suspected from cropmarks at Whitekirk. In Aberlady’s Glebe Field, geophysical survey has revealed what appears to be two timber halls, one overlying the other (meaning that they represent two discrete phases of occupation), and a series of ditch-defined enclosures. There are only two other sites in the Lothians that have yielded evidence for Northumbrian settlement: one at Eldbotle, near North Berwick, and another at Ratho, Midlothian. Even the placename Eldbotle, or Eld–bōtl, means ‘old hall or building’, and excavations have revealed evidence for occupation in the 5th-7th and 9th-11th centuries AD. At Ratho, a sunken building known as a grübenhaus has been interpreted as a weaving workshop due to the assemblage of clay loomweights found within it. Radiocarbon dates indicate activity here in the 6th-9th centuries AD. There were already established Christian settlements in the lands that were annexed by the Anglo-Saxons. We can trace these communities through changing burial practices: Christian communities buried their dead on an east-west alignment, in simple graves or in long cists (stone boxes dug into the ground and used much like coffins, with the deceased being buried lying outstretched on their backs). Many long cist cemeteries have been identified across the Lothians, indicating that there were thriving Christian communities before the Northumbrians arrived, and it seems probable that local tribal leaders had converted by around AD 600. The Northumbrians established ecclesiastical centres, bringing with them their own brand of Christianity, at Abercorn and Tyninghame, and thanks to recent excavations we now know that they established a monastic community at Auldhame. 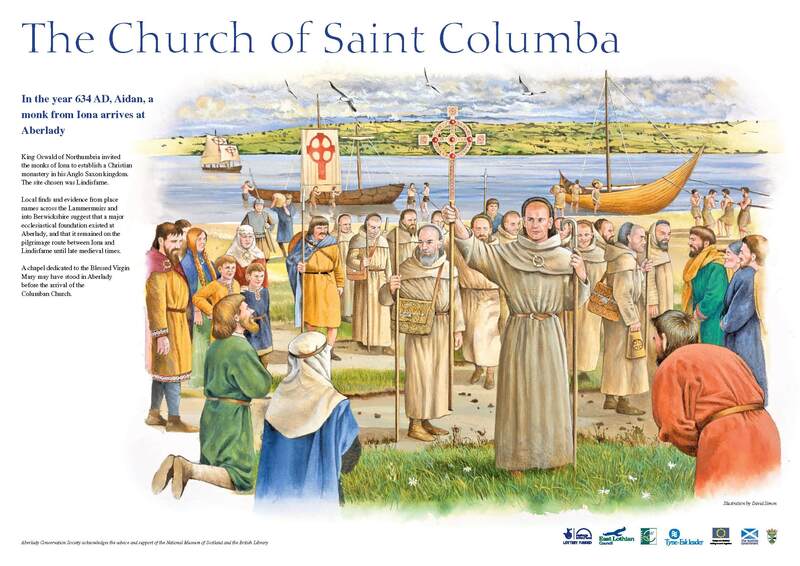 It is probable that Aberlady was already a recognised Christian centre prior to the arrival of monks from Iona, and that the settlement referred to by the Northumbrians as ‘Pefferham’ is in fact Aberlady. Carved stone cross fragments from Aberlady (see below), Morham and Tyninghame imply the existence of Anglian churches in East Lothian, but only at Tyninghame is there supporting evidence for such a church, which probably occupied the same site as the 12th century St Baldred’s Church which stands there today. Aidan of Lindisfarne is believed to have passed through Aberlady when he made the journey from Iona to Lindisfarne (left), leading to the creation of an overland pilgrimage route. The identification of two possible timber halls in the Glebe Field, combined with many chance finds of early historic material (below), leave us in little doubt that there was a settlement in Aberlady during the Anglo-Saxon period. One of the most telling clues to Aberlady’s Anglo-Saxon past is a fragment of elaborately carved stone that would once have formed part of a monumental sculpture, the Aberlady High Cross. It was discovered in 1863 built into the wall of the manse garden, which lies close to the chapel. It is not uncommon to find early historic carved stones built into much more recent structures – sometimes they are reused for their aesthetic appeal, and sometimes seemingly just because they were the right size and shape for the job! Although only a small fragment of the shaft – around 0.6m in length – survives, comparison with other examples suggests that the original cross would have stood over 6m tall. The style of carving suggests that it dates to the 8th century AD. The carvings include flora and fauna, and traces of tin lining the eye-sockets of some of the birds suggest that shiny stones or glass nuggets were placed there, adding a lifelike gleam to their eyes. It is likely that the original cross was painted in bright colours, although no trace survives – read more here. A reconstruction of the Aberlady High Cross stands in the Memorial Garden at the west end of the village. Anglo Saxon pin (centre), pinhead (left), and strap ends from Aberlady. Image reproduced here courtesy of National Museums Scotland. Another significant chance find is an impressive openwork pin head of Mercian style. Mercia was the kingdom to the south of Northumbria, in what is now known as the East Midlands. The pin head features a fantastical beast, and based on its style, the can be dated to the 8th century. Metalwork from this period is rare across England, and this example, far north of the usual geographical range for this type of artefact, is an important addition to the existing body of evidence.